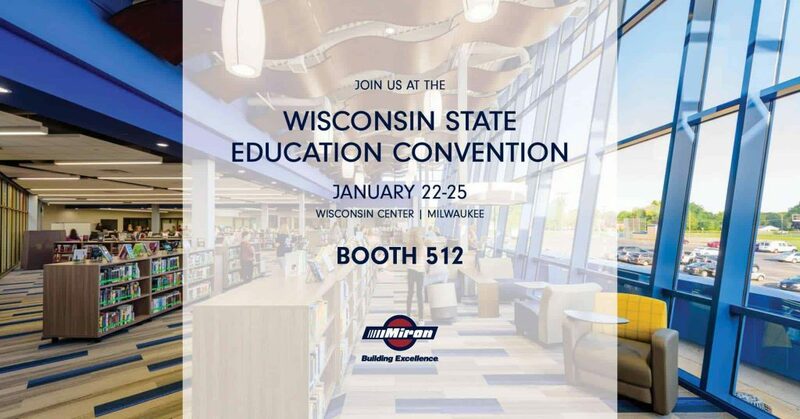 The 2019 Wisconsin State Education Convention kicks off on Tuesday, January 22 at the Wisconsin Center in downtown Milwaukee. Visit Miron Construction at Booth 512 in the Exhibit Hall. Miron’s education team is excited to be part of the state’s largest annual gathering of education leaders. We’ll have the opportunity to visit with our existing clients, make new connections, and share our industry expertise with Wisconsin’s public schools. Don’t miss our information-packed session with the Little Chute School District, “Our Referendum Passed – Now What?” on Wednesday, January 23 at 8:00 a.m. in WI Center/Room 202AB. Little Chute District Administrator Dave Botz and members of the District’s leadership team will talk through the sequence of action items that take place after a successful building referendum. The session will include a discussion of avoiding contract pitfalls, getting from conceptual drawing to pouring concrete, determining roles and responsibilities, learning what a contingency is for, and keeping your community and board engaged. The conference runs from Tuesday, Jan. 22 through Friday, Jan. 25 at the Wisconsin Center in Milwaukee. Exhibit Hall hours are Wednesday, Jan. 23 – 9 am to 4:30 pm and Thursday, Jan. 24 – 9 am to 2 pm. Come see us at Booth 512!